Get Clearer Skin With Origins! If you have been following my blog for the last year or so, you will know how much I am literally obsessed with Origins. I started using their products in December 2013 and other brands that I have used since just do not come close. In today's post i'm going to give you my review on Origins 'Modern Friction' exfoliator, and how using it transformed my skin.. overnight. So about a month ago, I tried some new products- an eye serum, face serum, day cream and night cream. As soon as I applied them, my face just went into a stinging frenzy. The next day I woke up with a bumpy rash from my chin, down my neck a little, and all the way up the side of my face to my cheek bones. It wasn't visually obvious and luckily they didn't turn into spots, but my skin just completely erupted in this horrible bumpy rash. Now I know my skin and I know that every time this happens it takes me a good month for it to disappear completely, and that's with taking my skincare back to basics. I usually head for my Simple range because my skin loves it. But this time I thought I would take a risk and add in an exfoliator to see if it helped. 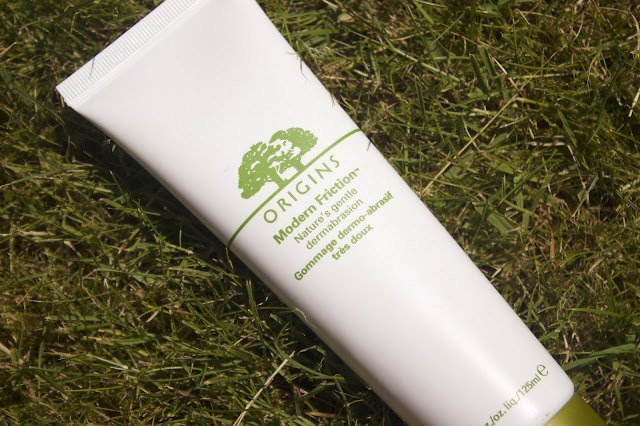 I have tried Origins' Modern Friction before and knew my skin got on with it, so I decided to try it out on this unusual bumpy rash and hope for the best. Boy was it the best I'd hoped for! After applying it to my skin and mixing it with a little drop of water, I massaged it in for 2-3 minutes, focusing on the raised, bumpy, rashy area around my chin and cheekbones. I washed it off with warm water and I swear to you right now, this rash had substantially shrunk. I was so astonished and excited and just could NOT believe it! I went to bed, woke up the next morning and my skin was completely clear and smooth, not a bump in sight or to touch. I know it sounds crazy! Now I might just be lucky, of course this may not work for everyone who has had a reaction to a product and if you are suffering with an outburst of spots or acne, be very careful when using an exfoliator because it can often cause irritation and a spread of bacteria, but, so long as you don't have any open wounds (like spots with open heads on) then I do recommend giving this a try if you are looking to refine your skins texture and get a more smoother, clearer complexion! Maybe even pop into your local Origins, you can find them in most department stores and just ask for a sample. Usually Origins in general are very generous with providing samples, so speak to the counter assistant and ask for some advice.